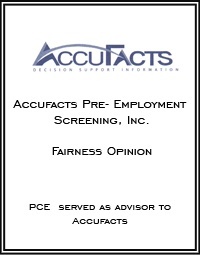 Accufacts Pre-Employment Screening, Inc. provides pre-employment screening services. The company provides background checks, drug testing and other screening services. It services also include employment history verifications, criminal history checks and examinations of motor vehicle records. The company was founded in 1994 and is headquartered in Longwood, FL.